A distinctive design, but will it's prints match expectations? The HP A826 is surely as much a style statement as a printer. It looks like a prop from a 1950s sci-fi B-movie, and will certainly provide a talking point. The touch-screen interface adds to the fun-factor and, as well as a selection of photo enhancements and picture effects, it lets you draw on your photos using a stylus that rests in a narrow groove under the LCD. You don't need to use the stylus for everyday printing operations, though - you can tap the on-screen buttons using a fingertip. 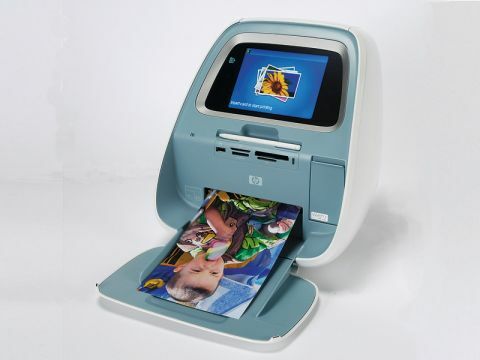 As well as printing regular 6x4-inch photos, the A826 can also produce borderless 7x5-inch prints. The results from the A826 were identical to those from the cheaper A526, which isn't surprising given that they use the same inks and paper. The Epson produces vivid portrait shots, but its rivals can produce slightly better greens and blues in the landscape image.